Story Time is not your typical reading circle. Betty Good, HDC MidAtlantic Resident Services Coordinator and Story Time’s supervisor, designed the program to engage students through a creative approach to reading. Stories are typically acted out in theatrical fashion, featuring cleverly designed sets, guest readers and visits from the book’s characters. Each Story Time features a word of the day to help the children apply the story’s premise to their own lives. When applicable, two books will be read aloud to explore each side of the story like “Goldilocks and the Three Bears” and “Goldilocks Rocks!” By exploring different themes and viewpoints, children are taught empathy which can assist with bullying prevention in their homes and at school. “Story Time is so much more than reading! It’s another opportunity to not only build their learning skills, but to build character as well”, Good says. 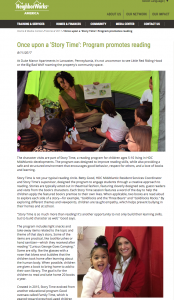 Story Time featured by NeighborWorks America. The program includes light snacks and take away items related to the topics and themes of that day’s story. Some of the items are practical, like toothbrushes or hand sanitizer which they received after reading “Curious George Goes Camping”, and some are silly like glasses with a nose that blows snot bubbles that the children took home after learning about the human body. When possible, each child is given a book to bring home to add to his/her own library. The goal is to have the children read and take home 20 books a year. Created in 2015, Story Time evolved from another educational program Good oversaw called Family Time, a program geared toward pre-school aged children and school readiness. However, participation declined as the children graduated from the program. Good realized she needed to revamp the program with a new focus on school-age children. She took the tools and tactics she learned while collaborating with a local educator and consultant, and developed Story Time. Since its implementation, more than 20 children have participated in the program. The first Story Time explored “Dumbo”. The program has featured a variety of books and stories, including classics like “The Three Little Pigs”, fairytales like “Jack and The Beanstalk” and modern books like “Spoon”. Story Time takes place every Wednesday and Thursday afternoon throughout the year. Please consider giving to Story Time. Please note “Story Time Fund” in the memo line. Thank you for your support!